By that, I’m referring to the unnamed (or even named) waterfalls you may spot during a Hana Highway driving tour but do not stand out on their own given their fickle flow. Now I’m sure a purist could probably make a case for some of the named waterfalls to each have a web page dedicated to them that ought to belong on this page and not be given special attention. I suppose it’s a subjective call. 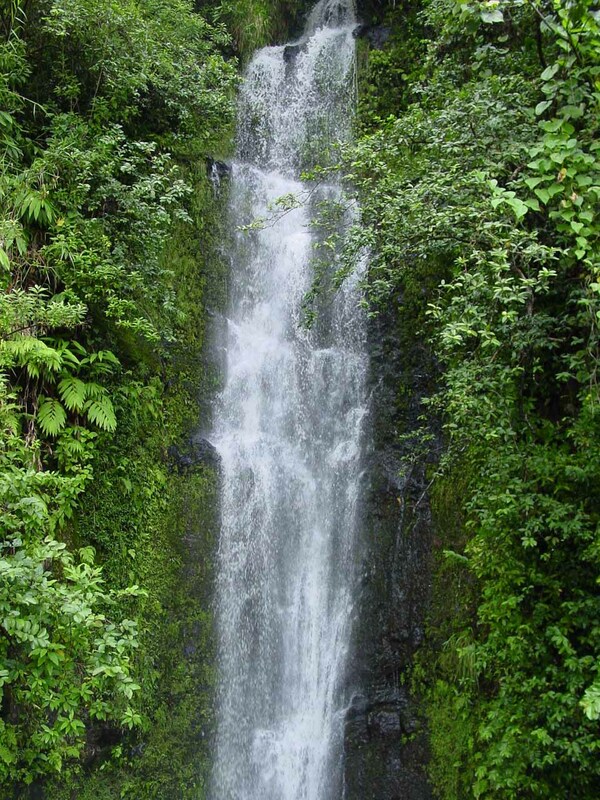 On the flip side, there are way too many waterfalls to single out and devote web pages to, and that’s really the main reason why this page was born. The “major waterfalls” have hyperlinks pointing to their respective dedicated pages so you can read more about them over there instead of cluttering this page. So why should you care about this page? 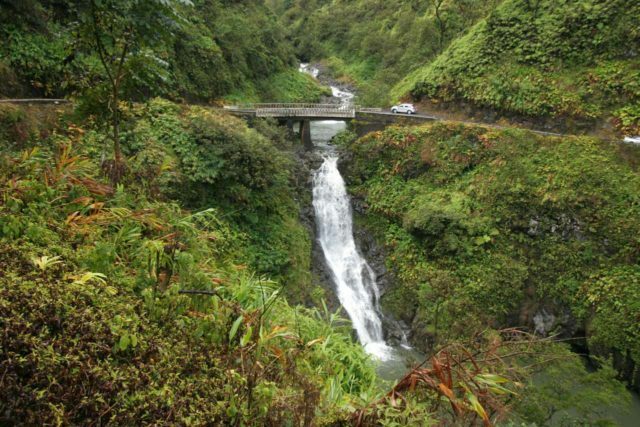 Well, if you’re looking for a little waterfalls road guide, you may find this page useful because we’re listing out all the waterfalls that we’ve encountered in the order we’ve seen them (and how you’re likely to see them) driving in a clockwise direction towards Hana from Central Maui. 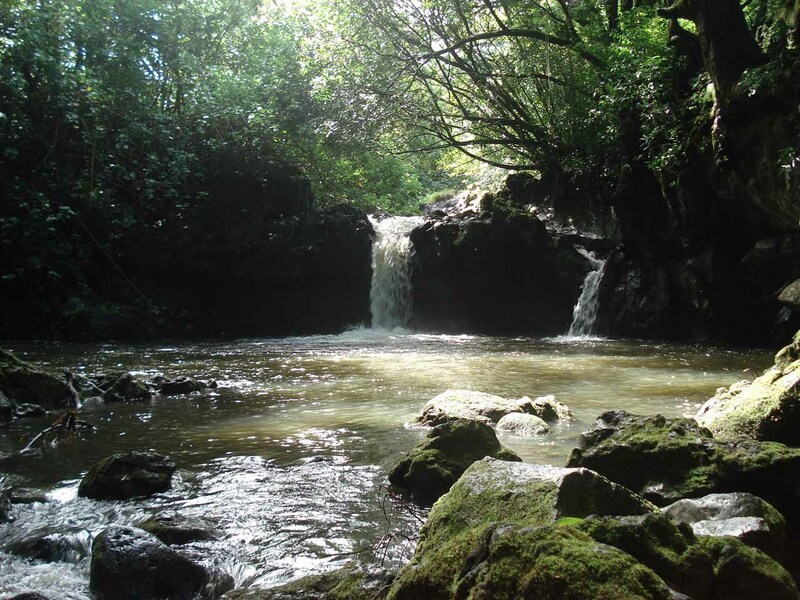 As added motivation to stop at some of the more obscure waterfalls described on this page, you may find that some are secluded swimming holes where you may be able to have it all to yourself! 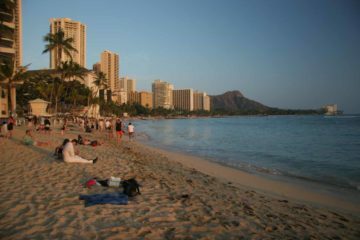 Others may be hidden gems if you happen to be there at the right time. Then again, there may be others where access to them may be unreliable due to trespassing concerns. Finally, I have to point out that it’s quite conceivable that most of the waterfalls in windward Maui may have had more reliable flow in the past. 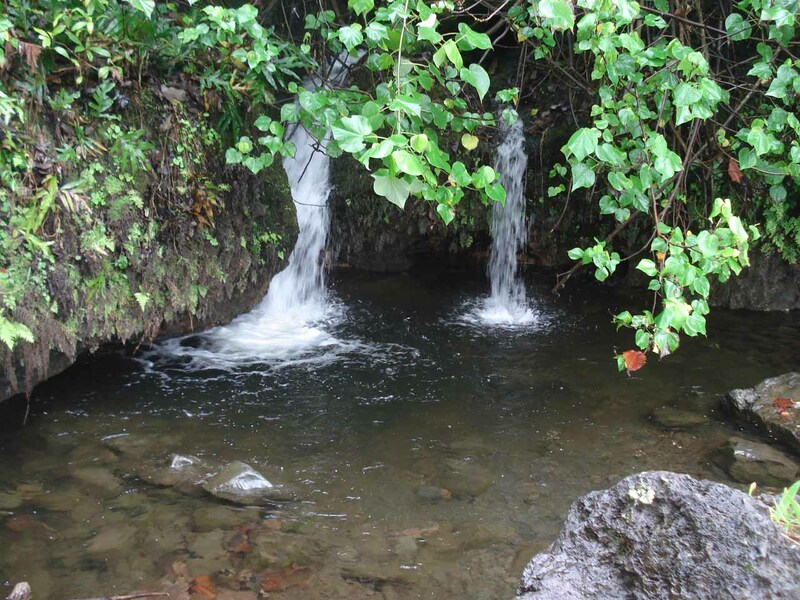 However, with the advent of East Maui Irrigation (EMI) ditches way upslope from the road, most of the streams no longer have reliable flow further downstream of those ditches. 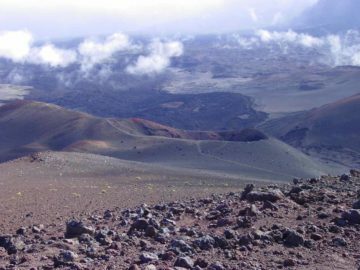 I believe the reason why the ditches were there in the first place was to divert water towards Central Maui to feed thirsty sugar cane crops. 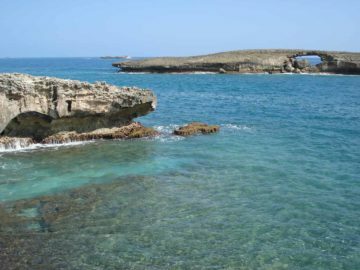 The bottom line is that you’re likely to find most of these waterfalls in a state that’s dry, trickling, or in a flooded state if it’s raining. 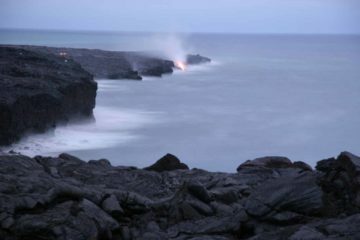 It’s not likely you’re going to find them in an in-between or satisfying steady-flow state. So without further ado, here’s the road guide down below (assuming clockwise direction). 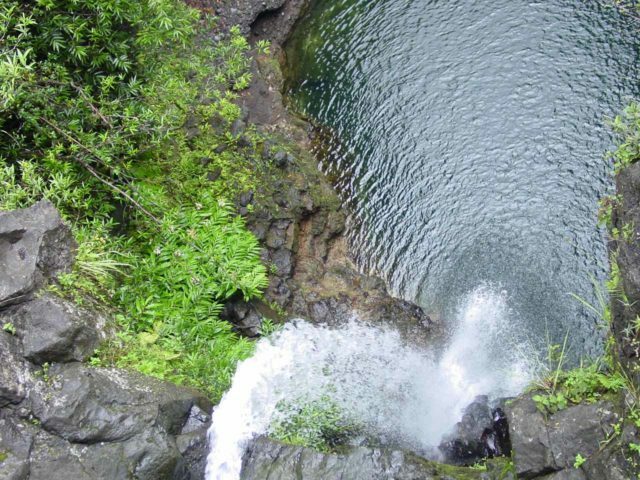 The tabs below show the minor waterfalls featured on this page. We have a dedicated page for this waterfall. Waterfall on the Waikamoi Stream. As you can see, it’s quite visible from the road when it’s this flooded. 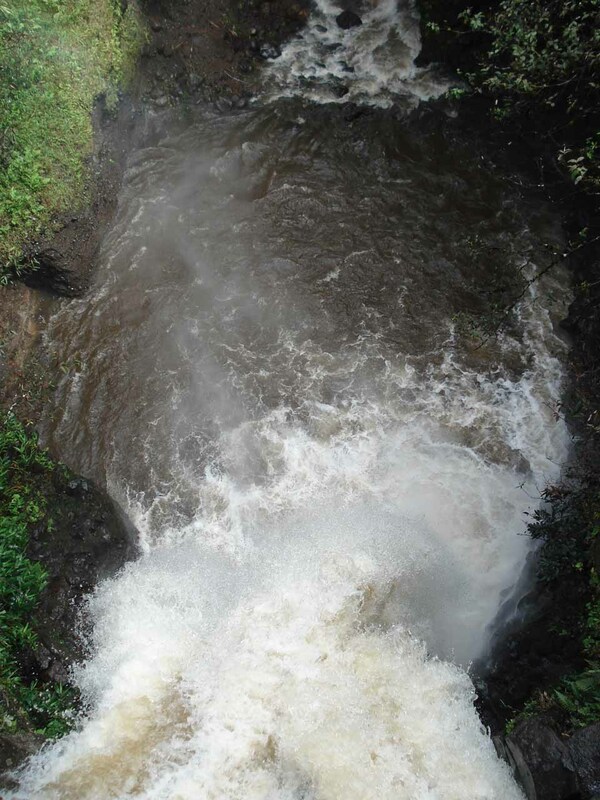 This waterfall appears to flow only during heavy rain. Under such conditions, this one’s easy to spot. 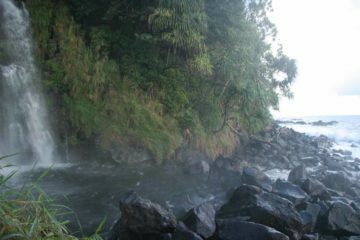 I tried to get closer to the falls for a better look, but there’s too much growth and the scrambling got more difficult the further in I went. 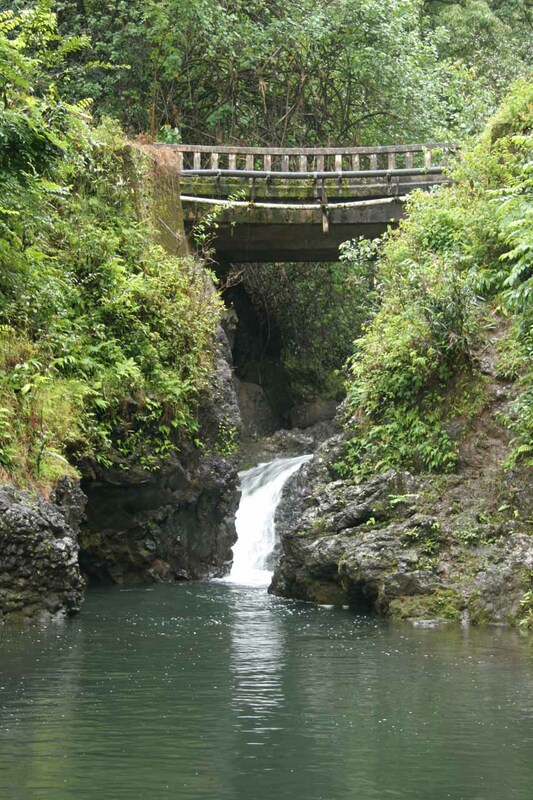 Look for pullouts on both sides of the road, just before the Waikamoi Stream Bridge at the 10-mile post. 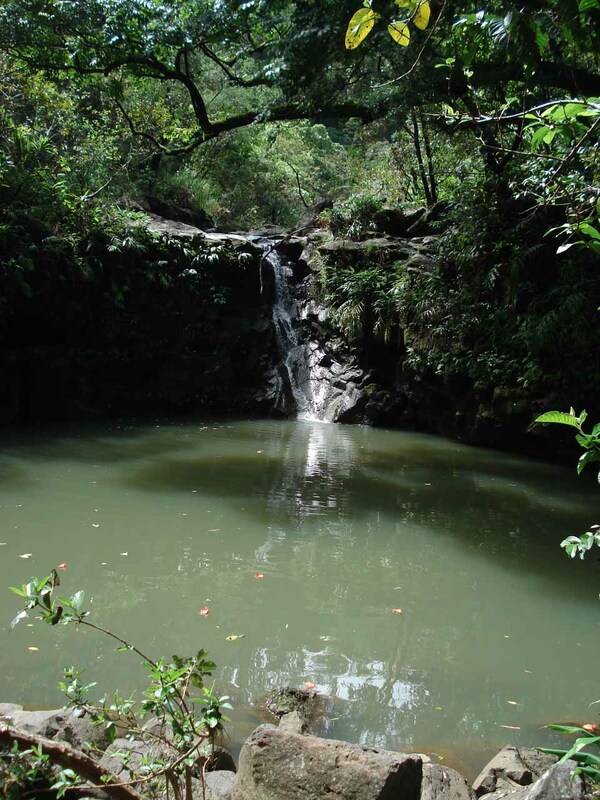 This tiny waterfall is just a short walk (less than 5 minutes) from the bridge over the Ha’ipua’ena Stream. There’s a pullout here with parking for 1-2 cars about 0.5 miles past the 11-mile post. 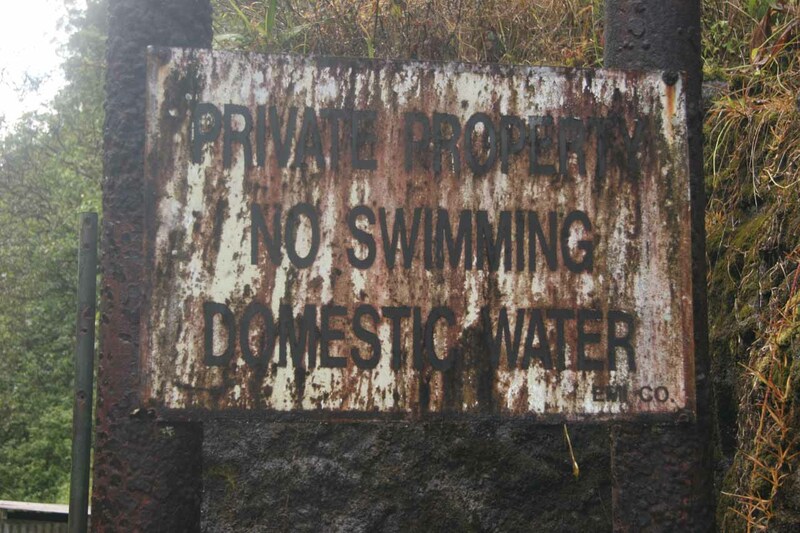 Also called the Sapphire Pool, it is a popular swimming hole, but the Keanae Taro Farmers have posted a No Trespassing sign to protect their taro fields. Look for a large pullout next to private Pi’inau Road on the mauka side of the Ke’anae Stream bridge, about 0.8 miles past the 16-mile post. 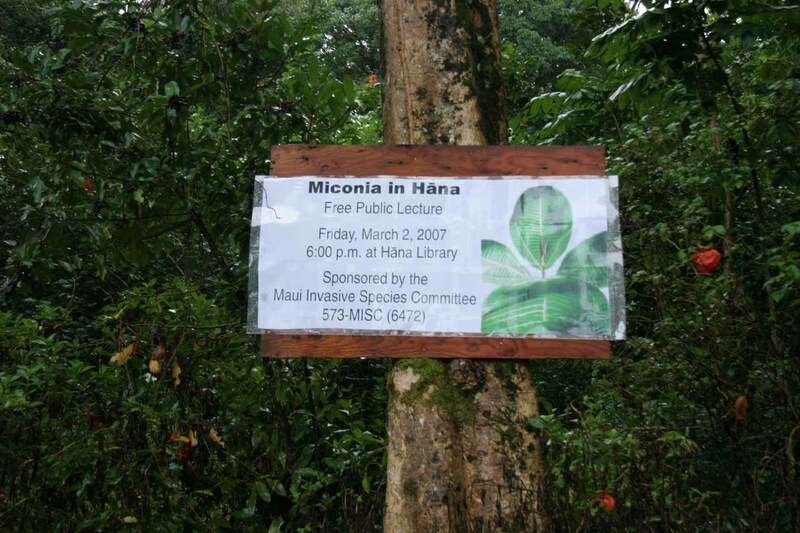 From the pullout walk about 30ft past the Pa’ia side of the bridge, where you will encounter a fairly easy downhill path passing a very large tree with a “No Trespassing” sign. Just a few paces down this path is Ching’s Pond. 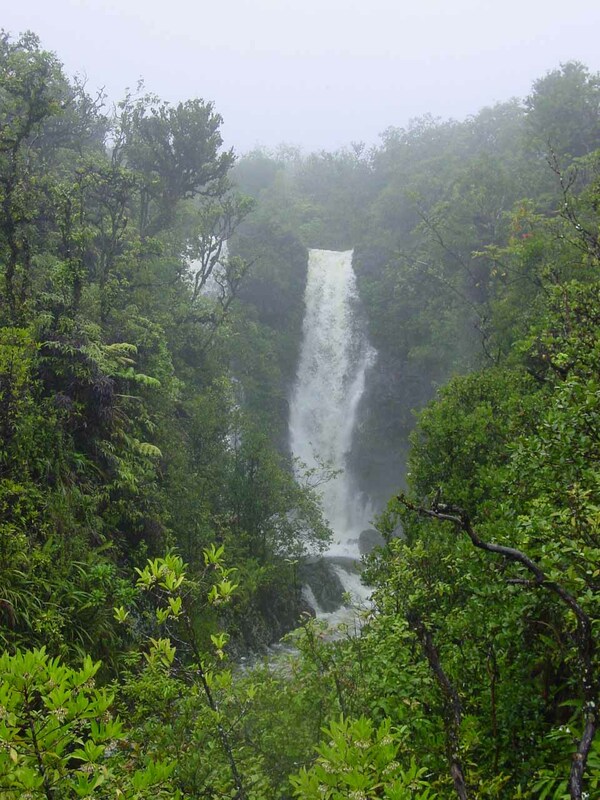 I’m treating this cascade as an indicator as to whether you should bother looking for the 150ft Lower Wailuaiki Falls (or Lower Wailua Iki Falls) just on the other side (downstream) from the bridge. This is viewable from the bridge about 0.9 miles past the 20-mile post. 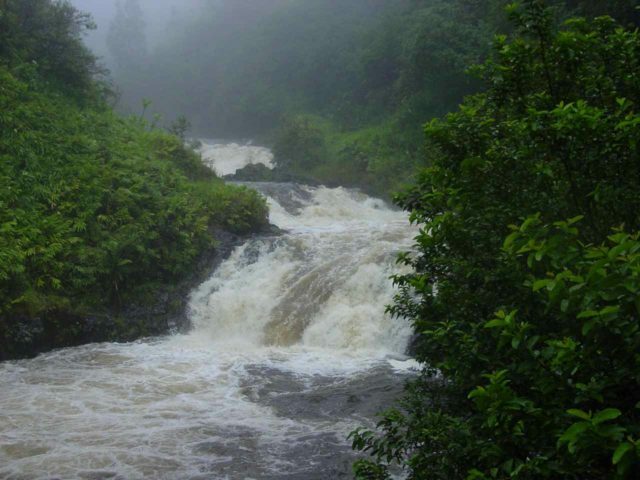 The above photo is a shot of the cascade in a flooded state during a rain storm back in September 2003. 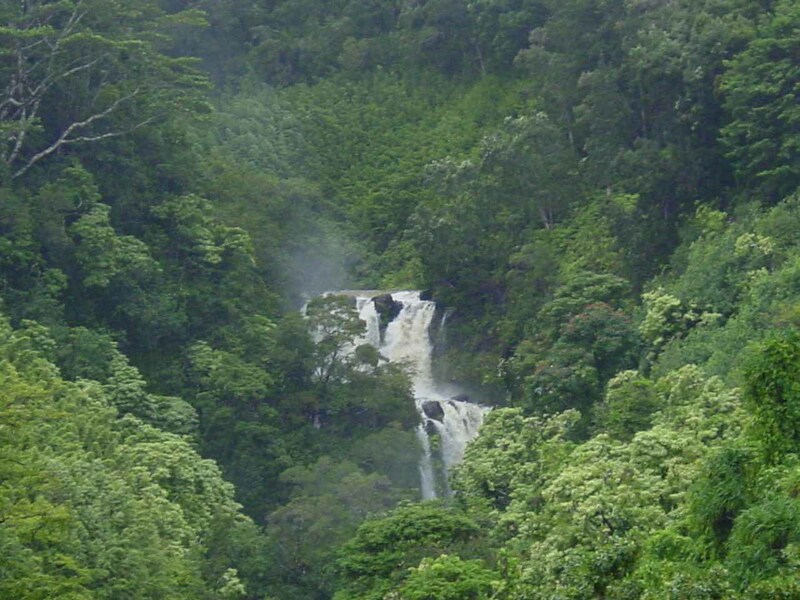 By the way, I’m actually not sure if this cascade is really the Wailua Iki Falls or if there’s a more significant waterfall further upstream by that name. I figure for all intents and purposes, you’re not likely going to spot the waterfall further upstream due to trespassing, ruggedness, etc. So its use as an indicator for the next waterfall is warranted. 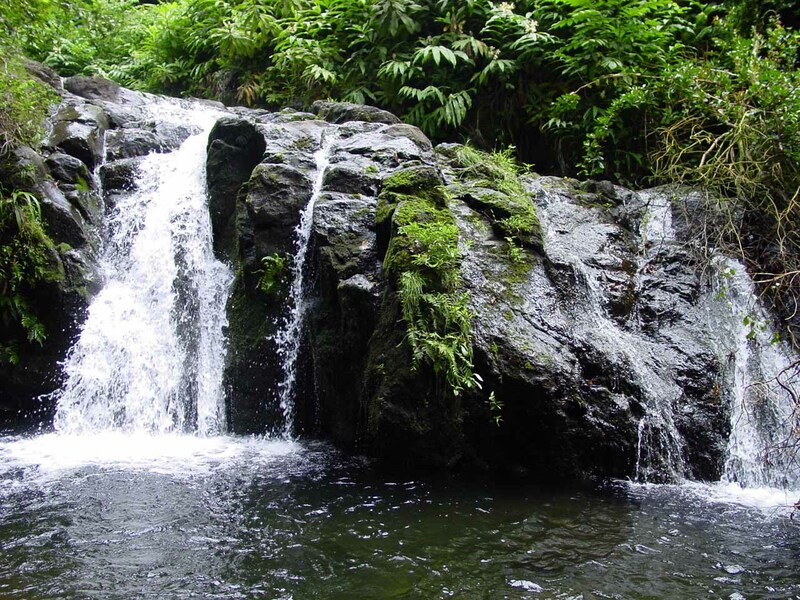 This waterfall is real easy to miss if you’re headed towards Hana, but real easy to spot if you’re going counterclockwise away from Hana. 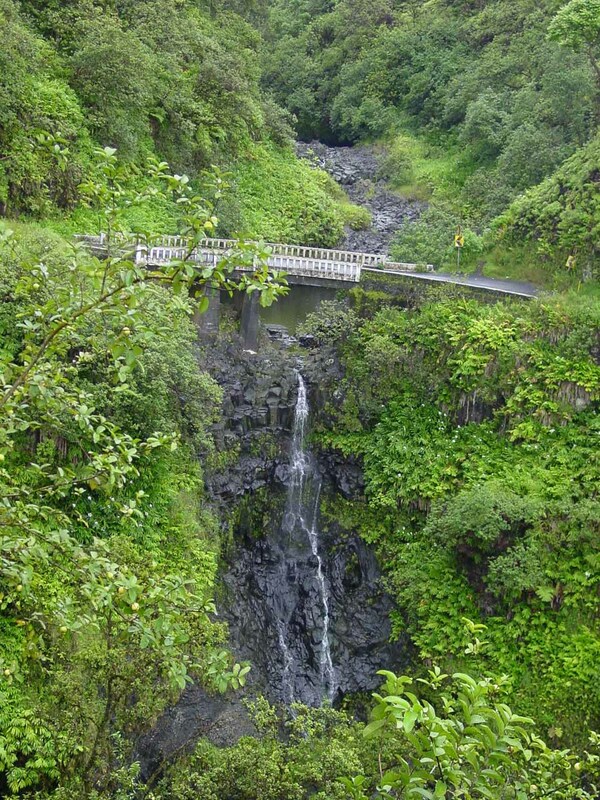 You can walk from the Wailua Iki Stream bridge by walking cautiously uphill (towards Hana) along the road to view the falls. 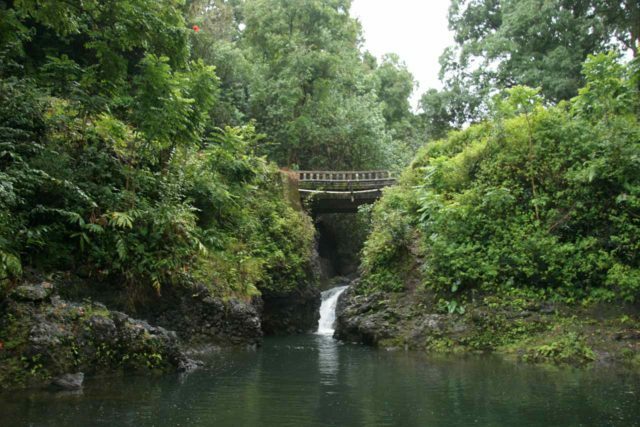 Another way to see it is to drive past the bridge towards a second pullout, then walk downhill (away from Hana) to view the falls. This waterfall had all the makings of a real powerful beauty to behold. Even though it’s visible from the road, accessing it is nontrivial due to the EMI (East Maui Irrigation) infrastructure built around the bridge by its stream. This attractive pair of twin waterfalls on the Kapaula Stream appears to only flow during heavy rain. I’ve seen it disappear or trickle just one day after heavy rains subsided so it’s definitely ephemeral. When it does flow, I’ve never been able to get a clean look at both falls. 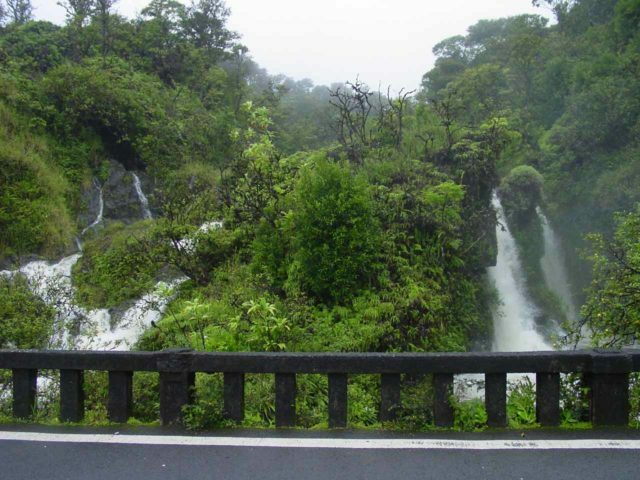 There’s a pullout just past the Kapa’ula Stream bridge, next to a private 4wd road, about 0.6 miles past the 23-mile post. Once you’ve pulled out, you can walk towards the bridge for a look. 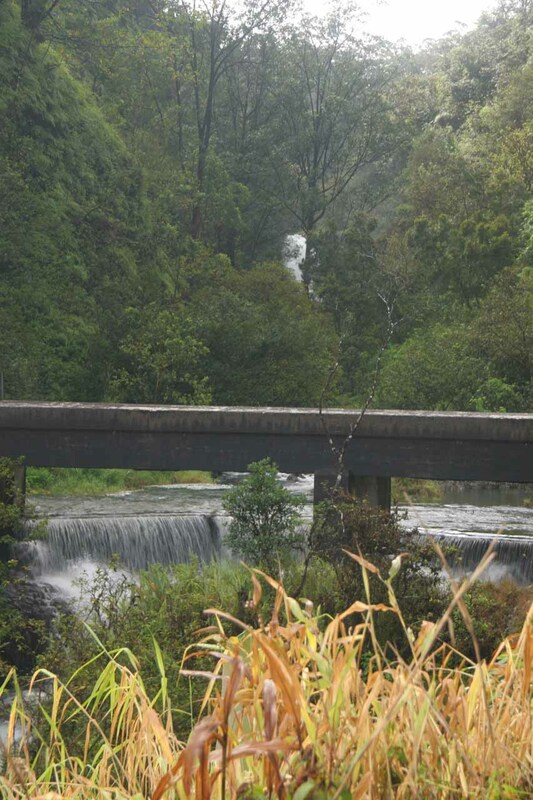 This is a roadside waterfall that can be quite impressive when it’s raining hard – as in this photo. 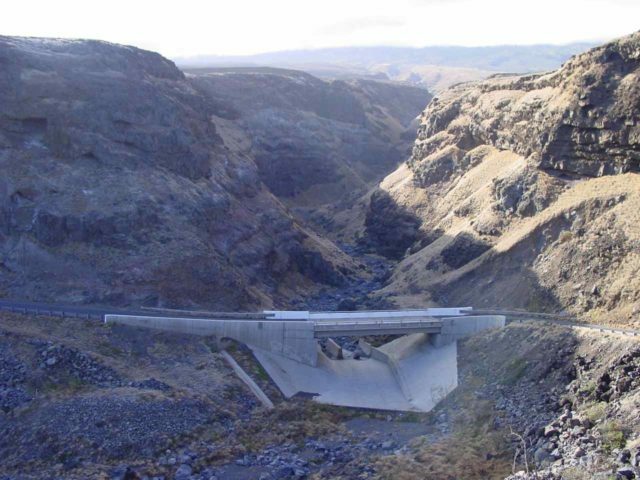 There are pullouts near the 24-mile post on both sides of the road and both ends of the Hanawi Stream bridge. 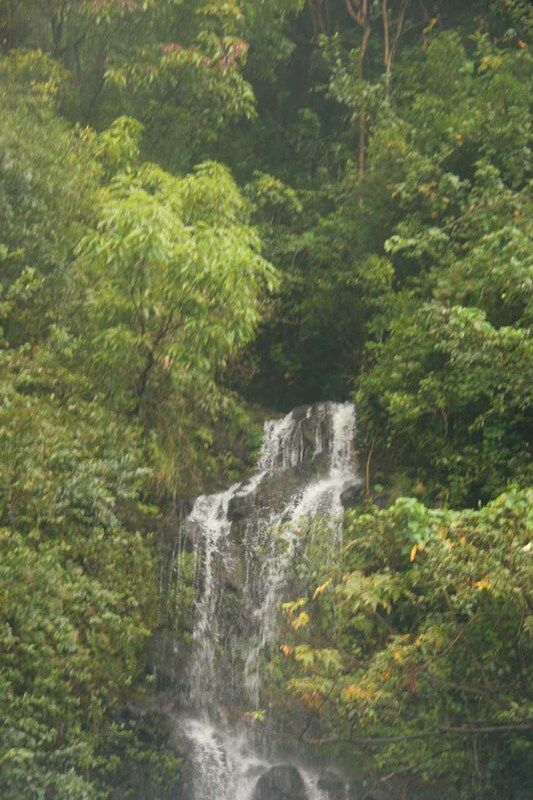 Note there’s a Lower Hanawi Falls, which is said to flow reliably because its stream was untouched by irrigation ditches (its watercourse flows through springs). However, it requires a hike somewhere off the Nahiku Road and I understand that it goes through EMI land. From what I know, they haven’t granted permission to access it (though some people have tried and made it). To be honest, we haven’t seriously tried to find it so we can’t really say more about it. 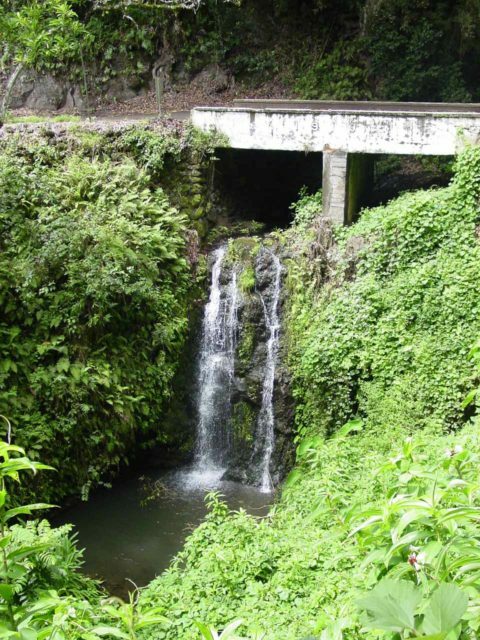 This is a also roadside waterfall close to a bridge. Unfortunately, I was only able to get a top down view of it because I couldn’t find a way to get in front of it. 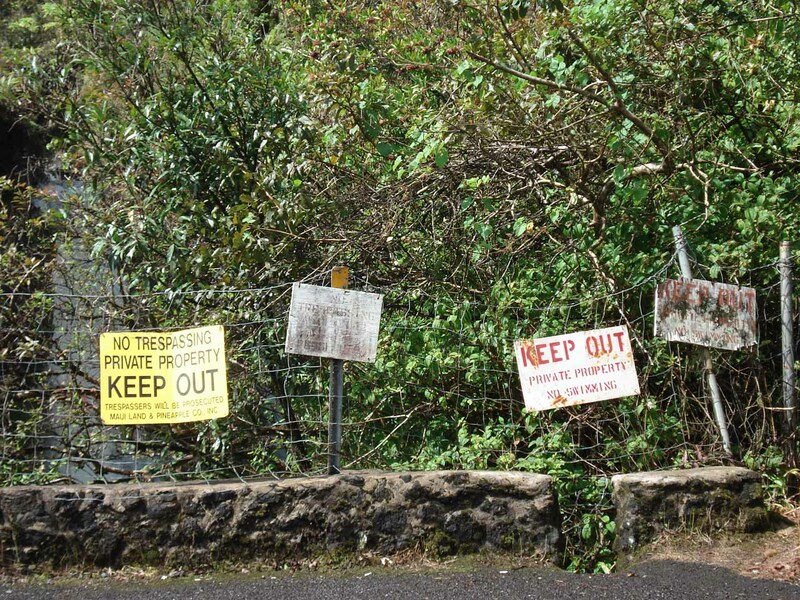 I’m sure there might be a way based on the presence of many “No Trespassing” signs here, but we don’t really have any intentions of testing the intent of those signs. 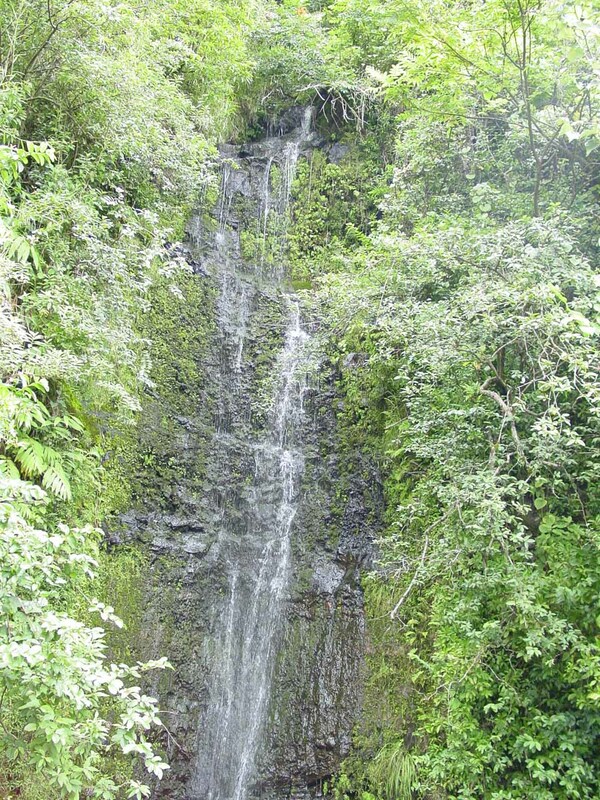 Look for this waterfall near the Nahiku Road turnoff at the milepost 25. 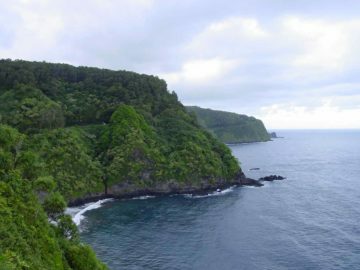 This could very well be one of the more extended stops along the Hana Highway that not a whole lot of people know about because it’s technically not on the main road itself. 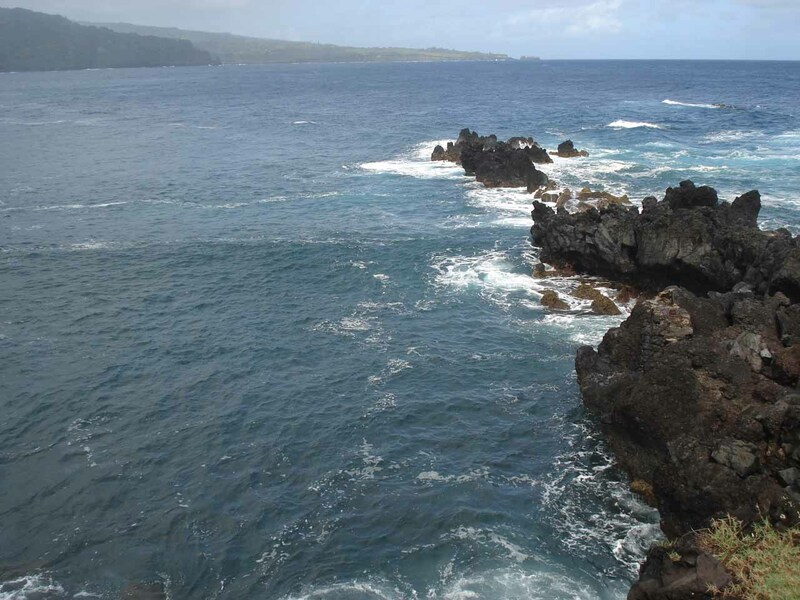 Indeed, it’s actually at the end of the Nahiku Road (about 2.5 miles from Hana Highway). The Nahiku Road turnoff is at the 25 milepost past the Makapipi Falls bridge. 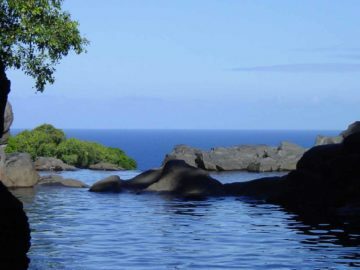 Among the benefits of coming out this way is a calm pool perfect for looking down the coastline towards the Keanae Peninsula. 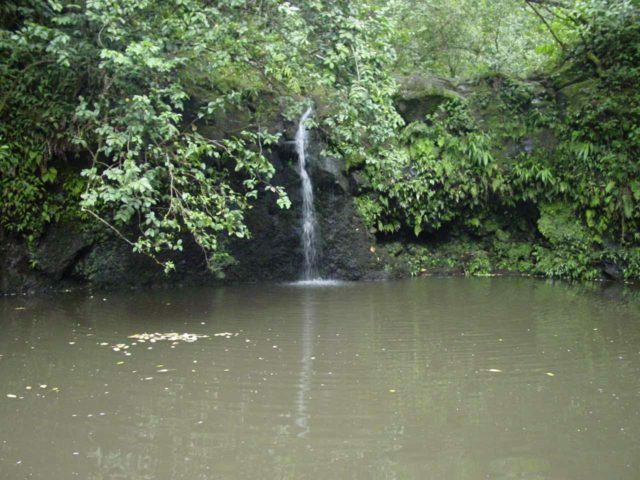 There’s also a nice little waterfall (pictured above) though that one is a bit hidden because it was not signed and the path was a little tricky to find. 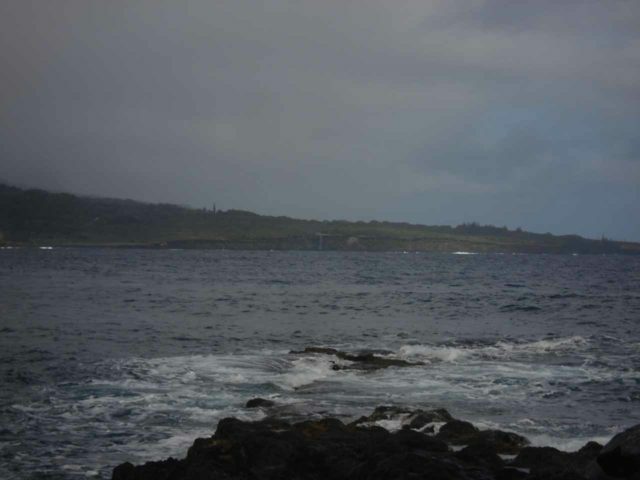 From the end of the Nahiku Road at the Nahiku Landing, head about 150ft uphill from where the guard rail ends on the left side of the road. There’s an overgrown path leading down from the road and towards the stream. A little bit of scrambling along the stream gets you to this spot. 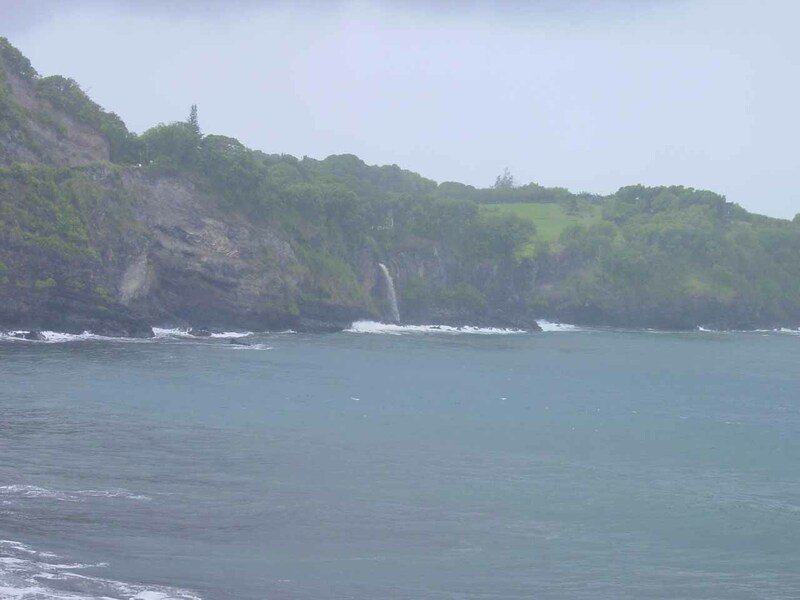 It may not look like it in this photo (you have to look REAL closely), but there is a waterfall leaping off the Keanae Peninsula right into the ocean! This one is called Waiokilo Falls, and if you’re not flying a helicopter or boating the rough seas to get closer to it, then Nahiku Landing is probably the only place to view the falls. As you can see in this photo, clearly a telephoto lens is necessary to bring it close enough to capture. Too bad this one doesn’t have pullouts around the bridge to get out of the car to take photos. So what I’ve noticed that most people do is to slow down, stop on the bridge, have someone in the passenger seat take a photo, and then move on. 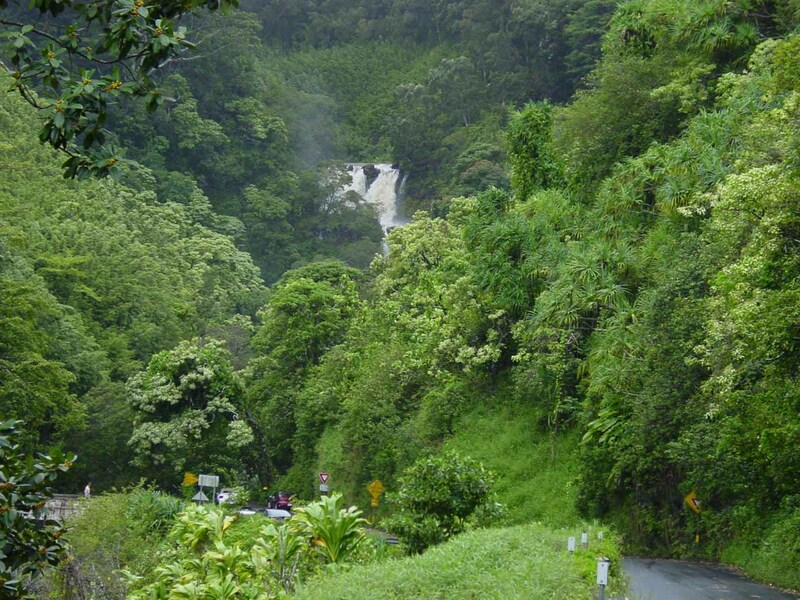 Otherwise, you’ll have to go all the way to Wailua Falls, then walk uphill towards this waterfall without getting in the way of traffic. 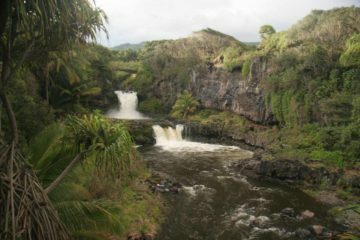 We saw this waterfall just as we crossed over a bridge as we descended into a gulch containing Wailua Falls. 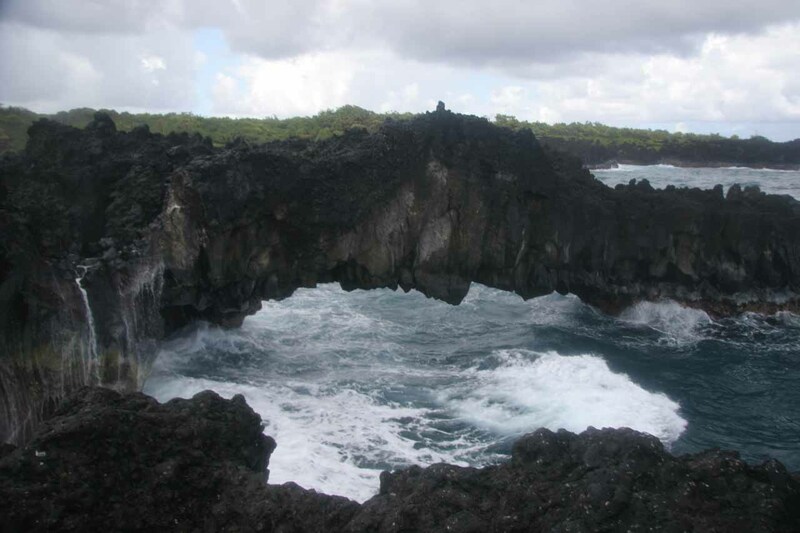 On our latest trip here in 2007, the bridge over Paihi Stream was damaged from the October 2006 earthquake near Kona. So they built a temporary bridge to bypass the original bridge, but that temporary bridge made it awkward to photograph this waterfall as you can see in the photo gallery below. 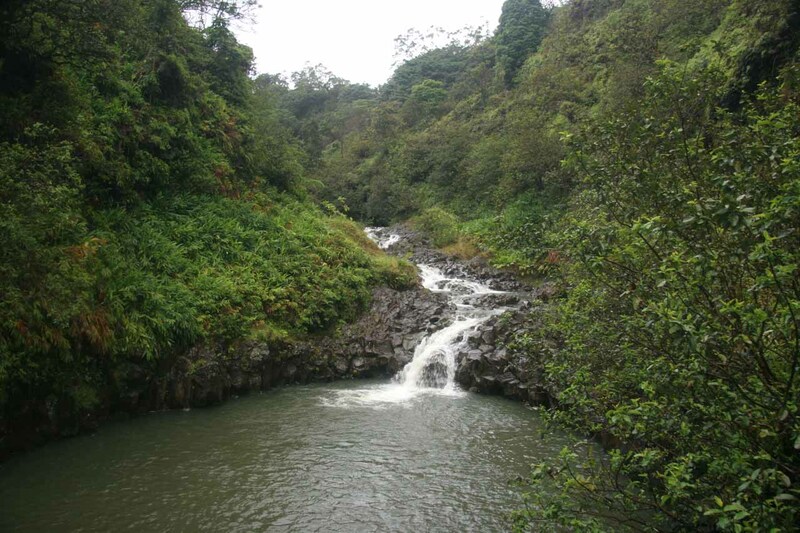 The Blue Bible dubbed this as the “Photo-sized Falls” (a lame name), but it’s really on the Hahalawe Stream. 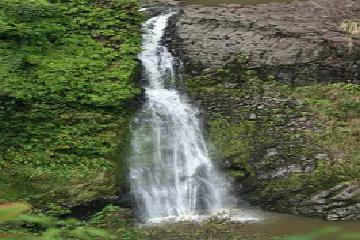 Getting this view of the falls requires a steep scramble from a pullout near the 43-mile post, just past the Hahalawe Gulch bridge. The pullout is about 0.9 miles past the 44-mile post. 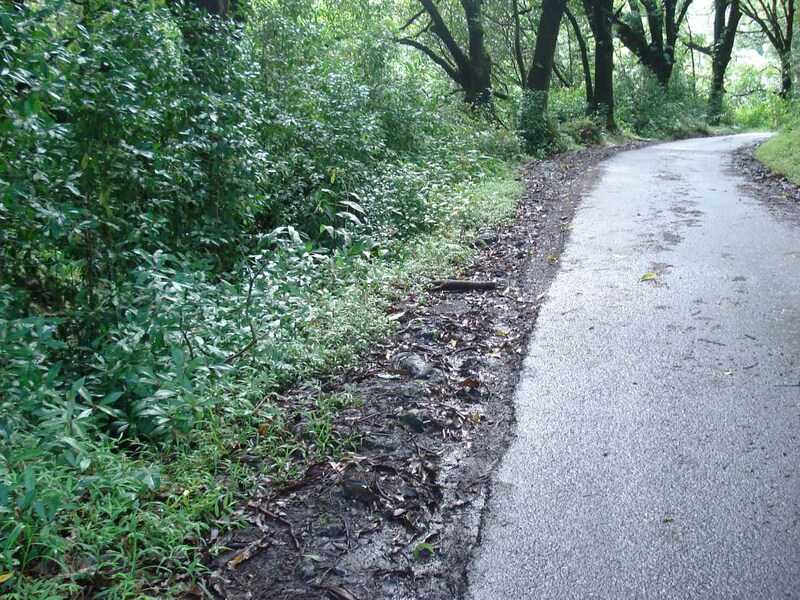 From the pullout, a steep primitive path goes underneath the road to the base of the falls. I noticed this waterfall while driving between mile markers 43 and 42 (there might be a pullout near the white bridge I think). Just beyond the bridge, there’s a roadside cliff and tiny hanging alcove on the mauka side containing a small shrine. 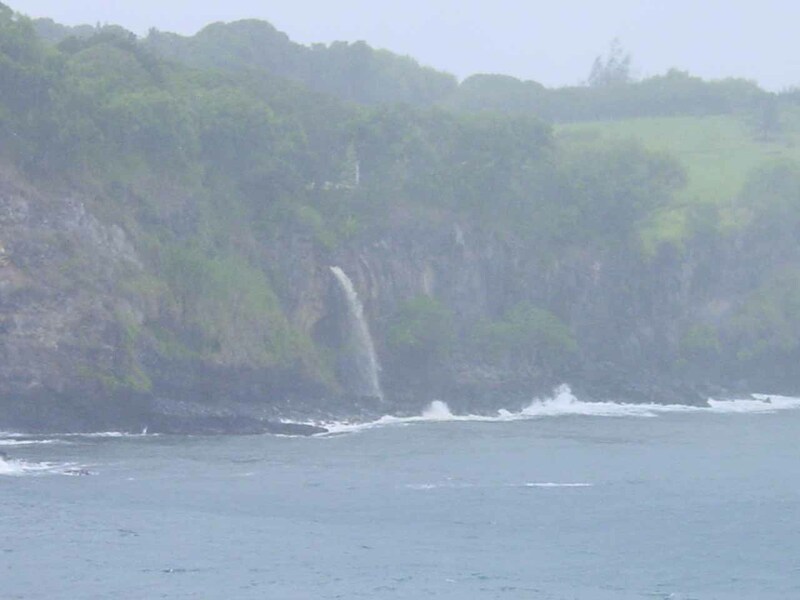 When you continue past Ohe’o Gulch and the road begins to become single lane and unpaved, you’ll have to look behind you when it’s raining to notice this waterfall spilling into the turbulent ocean. I believe this one only flows if it’s raining as I had also seen it disappear two dry days after a day of heavy rain. 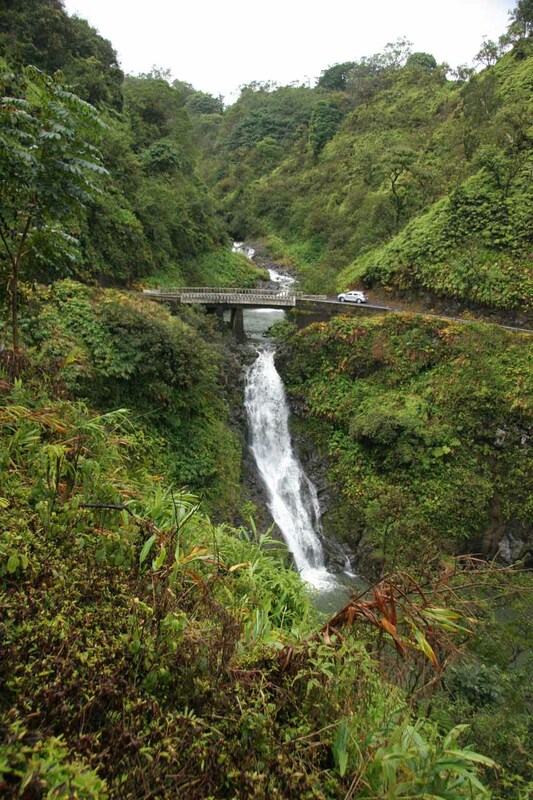 To my knowledge, most of the Hana Highway Waterfalls do not belong to a formal authority. However, for information or inquiries about the general area as well as current conditions, you may want to try visiting the Department of Land and Natural Resources (DLNR) website. 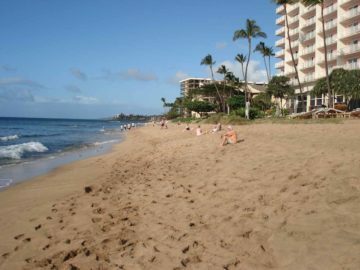 For a bit of context, we generally stay on the west side of Maui in either Lahaina or Ka’anapali. 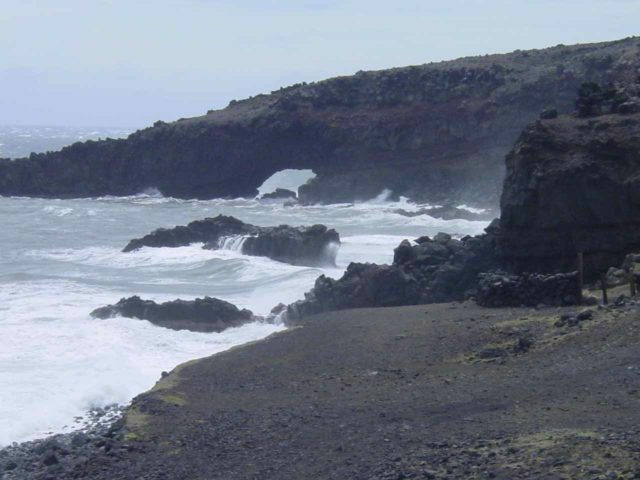 The drive from say Lahaina would require us to take Route 30 to Route 380 (taking roughly an hour without traffic). Once we’re near the town of Pa’ia, we’d then be on Hwy 36 (becoming the Road to Hana or Hwy 360). 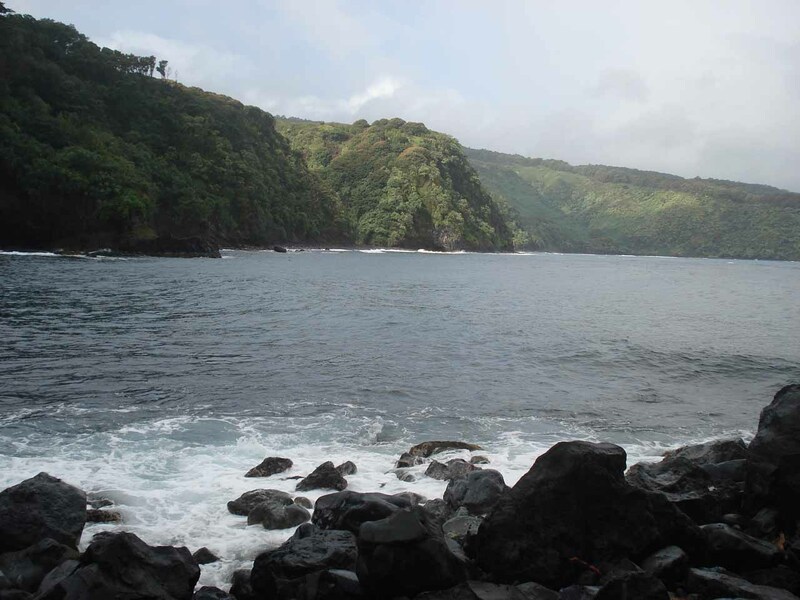 Getting to Hana would take at least 2 hours drive (45 miles) east of Pa’ia without stops.